I cook a lot, and I often have recipes that call for a tablespoon or two of Tomato Paste. A tablespoon is about .5 ounces… the smallest can of tomato paste I have ever seen is 6 ounces. What’s a frugal cook to do? Freeze it in portions, of course. Freezing tomato paste is easy and economical. 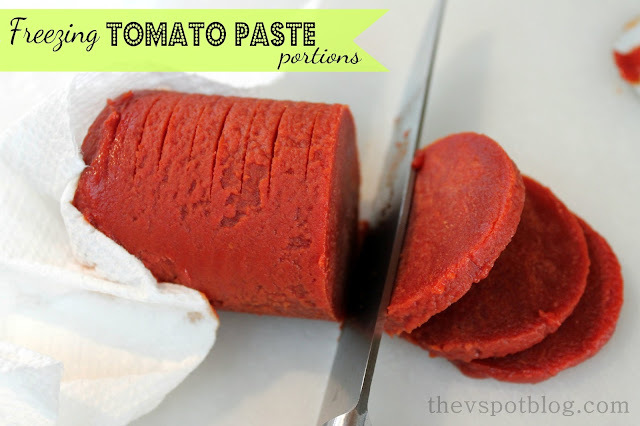 I hated having a recipe call for two tablespoons of tomato paste and then having to either figure out how to use the other 10 tablespoons left in the can or waste it by throwing it out. Finally I decided to just do a little pre-planning. Start out by taking the can of tomato paste and putting the whole thing in the freezer for an hour or so. Grab some wax paper, a can opener and a sharp knife. Take the can out of the freezer and use the opener to open both ends of the can. Push the paste out of the can from one end. (You may need to run a little hot water over the can to loosen the paste up a bit, but it should push out.) I wanted to have freeze the paste in tablespoon sized portions, so I needed to score the paste to figure out my 12 slices. Run the knife under hot water if you need to, and slice the paste into disks. Work on top of the wax paper because a) it makes the disks easier to freeze; and, b) tomato paste stains cutting boards. Return the disks to the freezer to fully harden, then pop them into a baggie. Now it’s easy for me to just grab the amount of tomato paste that I need for sauces, etc and I don’t waste food. Do you have any tips on storing food when you just need a little bit? Thank you for this! I’d actually given up buying tomato paste because of the can dilema and only two people in this household. I love this idea and hate to waste any food! This is wonderful! bulk sausage, cut into small pieces , freeze on cookie sheet, then bag up amount you want to add to soups or beans for example and put into ziploc freezer bags. you can do same with grapes, strawberries , blueberries etc. This is why you are in charge Viv. Great idea. 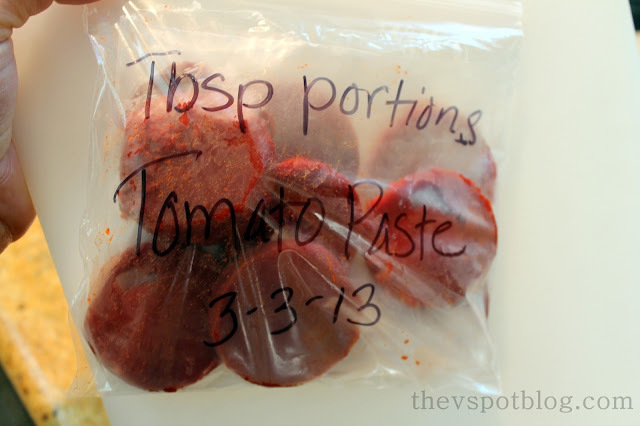 You can also use an Ice cube tray and freeze a tablespoon of the paste in each portion.when completely solid just pop them out to a ziploc bag.